Be the Weapon! Be the Asteroid! BioWare posted one of their infamous April fool jokes today – The ultimate noob killer! Take your Asteroid to Space! Who needs blaster bolts, ion cannons, or missiles, when your ship itself can be the weapon? Thanks to new Czerka technology, pilots can now jump into the cockpit of The Asteroid and take out their enemies head on. Blend into the battleground and lock onto unsuspecting enemies. The Asteroid specializes in tractor beams that reels their victims in. By the time the target realizes the situation, they will be blown to smithereens across the Asteroid’s rocky hull. More aggressive pilots will enjoy ramming into their foes with deadly accuracy. They won’t know what hit them until you hit them! Pilots should keep in mind that like the Bomber, the Asteroid is a big target with low maneuverability, blending into the terrain is a necessity for survival. Since this ship role has the strongest hull armor in Galactic Starfighter, they have no shields to protect them. 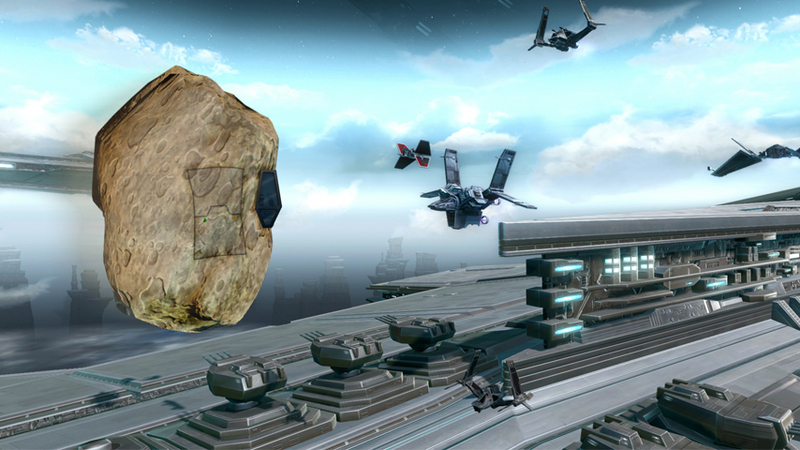 Tactical gameplay is key with the Asteroid. If you enjoy ramming your starfighter into your enemies and taking foes out from the shadows of space, the Asteroid is the ship for you! Originally Posted by DOHboy View Post not a huge GSF player, dabble now and then. What happens when two asteroids collide? If the ships crash into me, do I get a kill rather than they getting a suicide? Since we’re spoiling achievements, I should also let you know about the “‘Roid Rage” achievement, which you get after being killed 10 times in a row while piloting the Asteroid and then quitting the match mid-game. Since Musco and Tait are telling you achievements, I’ll throw in my personal favorite. So we have new achievements being leaked. willing to dish on any new titles? Example: DOHboy “The Rock” Johnson.